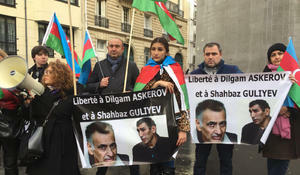 A group of Azerbaijanis held a protest action in front of the Armenian Embassy in France, Report informed on December 15. 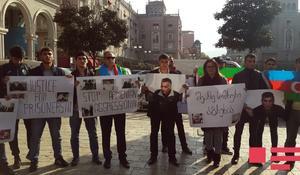 A protest action demanding the release of two Azerbaijanis Dilgam Asgarov and Shahbaz Guliyev, who are kept hostages by Armenian militaries in the occupied Nagorno-Karabakh region of Azerbaijan for more than three years, was held in front of the Armenian Embassy in Tbilisi, Georgia, APA reported on November 16. 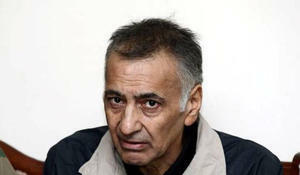 Baku keeps in focus the issue of releasing Dilgam Asgarov and Shahbaz Guliyev, taken hostage by Armenian militaries. The European Court of Human Rights (ECHR) has begun a communication on a lawsuit filed by Firuza Askarova and Albina Veysalova, spouses of Azerbaijani hostages Dilgam Asgarov and Shahbaz Guliyev. Representatives of the International Committee of the Red Cross (ICRC) have visited Dilgam Asgarov and Shahbaz Guliyev, two Azerbaijanis, who are kept hostages by Armenian forces in Nagorno-Karabakh. The International Committee of the Red Cross (ICRC) has visited two Azerbaijanis, Dilgam Asgarov and Shahbaz Guliyev, who are kept hostages by Armenian forces in Nagorno-Karabakh. Dilgam Asgarov and Shahbaz Guliyev, two Azerbaijanis who are kept hostages by Armenian forces in Nagorno-Karabakh, are experiencing health problems, said Eldar Samadov, the deputy head of the working group of Azerbaijan's State Commission on Prisoners of War, Hostages and Missing Persons. The International Committee of the Red Cross (ICRC) has visited the two Azerbaijanis, Dilgam Asgarov and Shahbaz Guliyev, who are kept hostages by Armenian forces in Nagorno-Karabakh. Dilgam Asgarov, one of the two Azerbaijanis for over two years kept hostage by Armenian armed forces, has written a letter to his family, his nephew Movlud Musayev has told reporters. Baku has lambasted Yerevan for denying the existence of Azerbaijani hostages and prisoners of war in Armenia and the occupied territories.